WASHINGTON/KABUL, Mar 10 2013 (IPS) - Two weeks after Afghan President Hamid Karzai demanded the withdrawal of all U.S. Special Operations Forces (SOF) from Wardak province by this date, the issue remains suspended in negotiations between U.S. and Afghan governments. Negotiations between the U.S. military command in Kabul and the Afghan government over Karzai’s demand were going on last week as an investigation by a joint team of Afghan and U.S. Special Forces officers into human rights abuses by forces said to be linked to the SOF unit in the province continues. “I can tell you that ISAF [International Security Assistance Force] and Afghan leaders are meeting,” ISAF spokesman Air Force Lt. Col. Lester T. Carroll told IPS Friday, and that Karzai’s demand for SOF’s withdrawal from Wardak “is being discussed”. Attaullah Khogiani, spokesman for the governor of Wardak province, told IPS Saturday that the U.S. SOF unit is still in its base in Maidan Shar district, and that a joint U.S. SOF-Afghan government investigating team looking into complaints by Wardak’s population about Afghan armed men linked to the SOF unit has demanded more time. The Karzai government has given the team three days to complete its investigation, but the team is saying it needs more time than that, according to Khogiani. The joint team is meeting with the families of victims of the crimes by the mysterious armed force in the province that has been blamed on the SOF, he told IPS in an interview. The identity of the Afghan forces that have imposed a reign of terror in Wardak that prompted President Karzai to demand the withdrawal of the SOF from the province remains a mystery to Afghan officials and residents there. Khogiani and other officials and residents of Wardawk interviewed by IPS in recent days say the Afghans are certain that the armed Afghans who have carried out murder, torture and extrajudicial detention of civilians in Wardak have been working for the SOF unit stationed there. But they still don’t know who they are or where they came from. U.S. SOF units have been responsible for recruiting, training, arming and monitoring Afghan Local Police (ALP), which have committed abuses in the past. But many people in Wardak believe the armed Afghans terrorising the villages could not be ALP, because they are not from the villages themselves and in fact appear not to be from Wardak province at all. Abdul Rahman, who commands a police checkpoint and is a village elder and district development council member in Maidan Shar district, told IPS that the armed men behind the abuses in that district are believed to be from an Afghan task force organised and supported by SOF in Kandahar and Helmand provinces. company who lives in Narkh district, told IPS the armed force that entered his village in mid-February are not local police recruited by the SOF but Afghan task forces who are staying with SOF in the base. Sarwary said a relative in his village told him that the militiamen had forced one of the residents to sit on an improvised explosive device with a gun pointed at his head. They threatened that if any of the members of the force were attacked by anyone in the village, they would blow up that individual. Another possibility, which has not been raised by Afghans, is that the “counterterrorism pursuit teams” trained by the CIA and acting outside any Afghan chain of command have been carrying out operations in Wardak. ISAF spokesman Brigadier General Gunter Katz immediately claimed that a review had already confirmed that “no coalition forces have been involved in the alleged misconduct”. But the Los Angeles Times reported a U.S. official as confirming that four of the nine had been seized in joint U.S.-Afghan raids last November and December. The complaints have involved both the unidentified Afghan forces and the SOF units. The Afghan intelligence agency, police and governor’s office were all aware that the SOF were conducting raids and detaining people, but were powerless to stop them, according to Jan. The inability of the government to respond to people’s complaints has created distrust of the government, Jan said. Jan said Afghan commanders in Wardak and Kabul brought in elders from the areas terrorised by the men allegedly associated with the SOF to meet with the SOF commander in Maidan Shar and tell him about the abuses they have been suffering. When that did not bring any improvement, Jan said, they went to Kabul to plead with the SOF commander in Kabul. That didn’t help either, according to Jan. Finally a delegation of Wardak people went to Kabul and complained to Karzai himself. Karzai then sent a representative to Wardak to get detailed accounts of misconduct by SOF personnel in Narkh and Maidan Shar, Jan said. After an official of the attorney general’s office also visited the province and heard similar accounts, Karzai made the decision to order the SOF out of the province. The perception that U.S.-sponsored militias from outside the province are committing widespread abuses has spawned conspiratorial explanations in Wardawk. “2014 is near and the SOF is going to leave,” Rahman said, “and that’s why they are turning people against government, and also disrupting the transitional process and bargaining to get permanent bases and immunity” – a reference to two issues still under negotiation. Karzai’s comment on Sunday that the U.S. and the Taliban were colluding to create insecurity reflected a similar conspiracy theory. In the background of the controversy, meanwhile, are negotiations between U.S. and Afghan officials on U.S. Special Forces operations after the 2014 transition begins. A Memorandum of Understanding signed May 12, 2012 between the U.S. military and the Afghan Defence Ministry was trumpeted by the Obama administration as giving the Afghan government control over such operations. 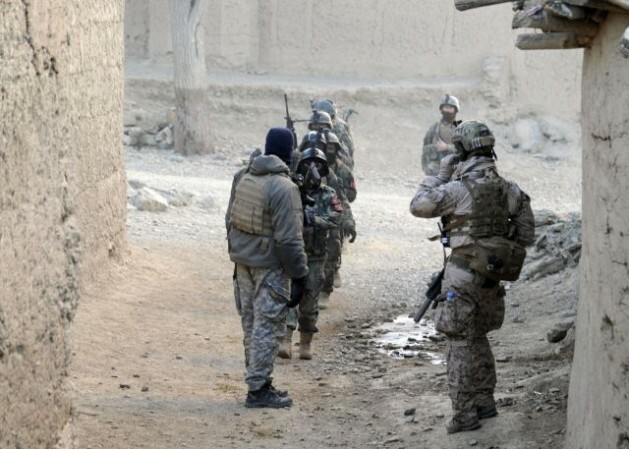 That meant that the SOF was still free to carry out other raids without consultation with the Afghan government, leaving the issue of their future still to be determined.